US P-RCN (Research Coordination Network) final meeting shows many publications and some outstanding questions. 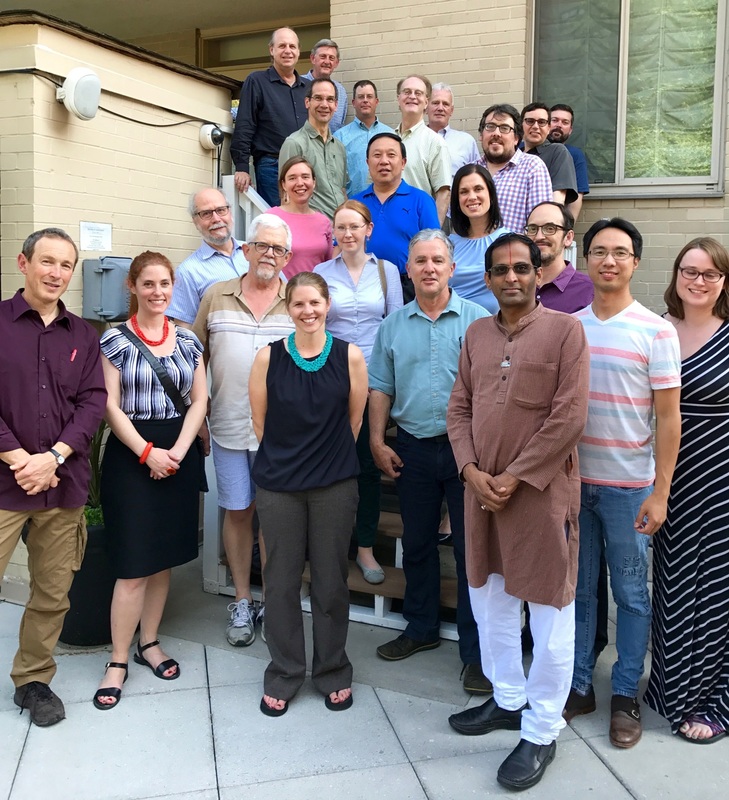 The US P-RCN (2013 – 2017, Phosphorus Sustainability Research Coordination Network, funded by US National Science Foundation, see SCOPE Newsletter 100 and 114) held its final meeting in Washington DC, 16-18 May 2017. P-RCN facilitated networking between scientists interested in phosphorus (P) sustainability by bringing together around 40 scientists from the US and the rest of the world for five working meetings. This has enabled these scientists to jointly publish a number of review/analysis papers in scientific journals (list below). A number of key issues for phosphorus sustainability have been addressed by the P-RCN group (below) and some important outstanding questions were identified and discussed at this last meeting. The P-RCN scientists will use the remaining months of the project to finalise a number of papers underway (see in list below) and to propose approaches to these outstanding questions. The institutes who have participated in P-RCN for all or part of the five years are the following US universities Arizona State University (lead), Arkansas, Heidelberg, Marquette, Minnesota, South Florida, Stevens Institute of Technology, Toledo, Washington State; non-US universities: Bangor Wales, Belfast QUB UK, Cape Coast Ghana, CEH UK, Tohoku Japan, Osaka Japan, Lancaster UK, Laval QC Canada, University of Technology Sydney Australia, China Agricultural University, Chinese Academy of Sciences; other organisations: IPNI (International Plant Nutrition Institute), ESPP (European Sustainable Phosphorus Platform), Agri Food & BioSciences Institute UK, AAFC (Agriculture & Agri-Food Canada), USDA-ARS (U.S. Department of Agriculture – Agricultural Research Service). Legacy phosphorus: fertiliser application since the second half of the twentieth century led to a considerable current accumulation of so-called “legacy” phosphorus in soils and in water system sediments. This has environmental, agronomic and resource consumption implications. A key paper from P-RCN collaboration documents this phenomenon for three river basins: Thames UK, Yangtze China, and Maumee USA (Powers et al. 2016). The implications of “legacy phosphorus” are discussed below. Metrics: on the one hand, there is a problematic lack of accurate, coherent and up-to-date data concerning phosphorus flows. This is widely noted (see e.g. ESPP DONUTSS meeting 2016 http://phosphorusplatform.eu/donutss). The most recent phosphorus flow data for the USA date from 2007 (Suh et al. 2011 http://dx.doi.org/10.1016/j.chemosphere.2011.01.051). On the other hand, there is a need for regulators and industry to have reliable phosphorus flow and impact data, to support decision making. The P-RCN group is developing the outline for a “phosphorus footprint” outline methodology. Nutrient – water – energy nexus: the P-RCN group note that phosphorus sustainability is inter-dependent with management of water resources, energy, other nutrients, and the complete food system. This led to the concept of “total value” of phosphorus recycling, where economic viability can result from integration of phosphorus recovery with management of nitrogen, water and energy. Transition Management Pathways: action on phosphorus is needed to address food security, resource dependency and environmental impacts. But phosphorus management is complex, locally specific and involves a wide range of stakeholders. Collaborative governance methods are needed to facilitate implementation of innovation in conservative industries such as water treatment and agriculture. In particular, a mapping exercise of transition pathways to sustainable phosphorus management in society was carried out for North America, based on consultation of the participants at the 2015 NAPPS Forum (NAPPS was the previous name of the Sustainable Phosphorus Alliance). Outstanding question: Where is the “legacy phosphorus” and does it matter? Powers et al. 2016 shows in three different rivers worldwide that a significant part of fertiliser applied over recent decades seems not to leave the basin within the time frame considered (comparison of basin P inputs to outflows in river total phosphorus) but does not show what part of the phosphorus is accumulating, over this time scale, in agricultural soils and what part in river bed sediments or sediments behind dams. Time scale is essential as phosphorus moves more slowly through soil-river systems than is often considered. Further key questions are what P sources contribute more and how to mitigate these? However, it is widely considered that some of Europe’s and North America’s farm soils (both arable and pasture) accumulated soil phosphorus over past decades (e.g. estimate of 550 kg P/ha average worldwide over the period 1965-2007, Nesme and Pellerin, COMIFER 11th April 2017 Paris, SCOPE Newsletter in press). This is logical, as in the past phosphorus was widely applied to soil up to the critical “breakpoint” above which crop response to phosphorus diminishes (see Johnny Johnston in SCOPE Newsletter 98). This often results in a soil build-up of phosphorus, by filling up part of the soil’s buffering capacity with phosphorus, so that the soil can supply adequate phosphorus to the plant. Subsequent applications of P are made primarily to maintain soil available P by replenishing crop removal. However, in some farms continued applications of phosphorus led to soil available P levels approaching a second critical breakpoint, beyond which the concentration of P in runoff water increases dramatically. This is particularly the case in regions with manure production, where manure application was often based on nitrogen not phosphorus crop needs, resulting in excess phosphorus application. In many jurisdictions, nutrient management regulations now limit such surplus applications of P to soils. Chinese farmlands also show a resulting accumulation of P due to overuse of chemical P fertilizers in past decades, leading to soil available P as Olsen-P increasing from 7.4 mg kg−1 in 1980 to 21 mg kg−1 in 2006 (Li et al., 2011, Plant and Soil; Li et al., 2015, AMBIO), but this situation is being overcome and total P fertiliser consumption in China starts to level off due to better root-zone nutrient management and “Zero increase” fertilisation policy. This plans an annual increase in fertiliser use of <1% 2015-2019 and no further increase after 2020 without yield loss (Jiao et al., 2016, Journal of Experimental Botany). An important point is that it takes a number of years of order of magnitude longer for crops to draw down soil phosphorus accumulation than it takes to build it up. To what extent does this increased soil P content result in significantly increased phosphorus losses to surface water (and eutrophication risk), if “legacy P” levels are not higher than the critical breakpoints above and if actions are taken to limit soil erosion (these actions are necessary anyway, independently of phosphorus)? Is soil “legacy phosphorus” today still an issue in regions (e.g. much of Europe) where farmers significantly reduced P fertiliser application after the 2008 price peak? What about regions such as Africa, Brazil or Australia? Here soils are phosphorus-poor and/or have high phosphorus buffering capacities: should phosphorus continue to be applied above crop needs to improve soil fertility in these regions and how to combine this with concerns about waste, resources, energy and the environment. Depending on the answers to the above questions, legacy soil phosphorus might be considered a positive in some situations (enabling a stock of phosphorus for farmers in case of supply disruption or price peaks, and enabling balanced fertiliser application, to fertilise the crop and not the soil) or negative in others (increased losses to surface waters, energy and resource consumption, without significant increase in crop productivity). Olsen P may underestimate risk of runoff or phosphorus losses to surface or ground water. On the other hand, methods often used in the USA such as Mehlich-3 and Bray-1 can overestimate the risk of P runoff, as the acid extractant solubilizes some Fe and Ca-P compounds built up in soil following long-term by-product applications. May not properly mimic plant root absorption and cannot represent the soil available P at a relatively broad gradient of soil P fertility. On the other hand, both regulators and the agricultural community are unwilling to change, because a large bank of past soil and agronomy (e.g. crop response) data is available for existing test methods, and results of new methods will not be comparable, so that farmers and farm advisors will not be able to interpret them, without costly and time consuming field soil-crop response trials (a wide range of trials using the new tests on different regional soils, P status, … would be needed to try to approximately calibrate results with existing test data). Also, an issue with the current testing methods, and possibly even more so with the methods described above, is the time and cost necessary to carry out the test. Unlike nitrogen, where N application can be adjusted real-time by the tractor using leaf colour of the growing crop, instant and real-time P analysis is not available. This limits to what extent farmers can realistically adjust P application to different parts of the field and to seasonal conditions (real crop needs). It is often stated that phosphorus use is very inefficient. For example: “<20% of P mined for fertilizer reaches the food products consumed” (Jarvie et al., P-RCN, 2017, taken from Neset & Cordell 2012). More specifically, Van Dijk’s study of EU phosphorus flows (see SCOPE Newsletter 117) indicates that “In crop production: 70% was taken up by crops”. However, Van Dijk’s data are from 2005, when Europe was still applying high levels of phosphorus fertiliser (before the 2008 price peak) and was probably accumulating “legacy P” in agricultural soils. Eurostat data suggest that the average “gross balance” of phosphorus on European agricultural land has halved since 2005, with a total gross balance of around 350 000 tonnes P/year for Europe in 2013 (most recent data). It thus seems clear that a better assessment of where phosphorus losses are really occurring is necessary, with up to date figures, for different world regions, in order to identify where actions to reduce losses can be effective. Ecosystem services and costs. The P-RCN group noted that is a glaring absence and insufficiency of economic data concerning the benefits of improving phosphorus management. The only estimate of job creation possibilities from phosphorus management and recycling is ESPP’s informal document from 2013 which suggests that phosphorus stewardship could generate 66 000 jobs in Europe (not taking into account jobs “saved” in farming), link http://phosphorusplatform.eu/images/ESPP_jobs_and_employment_outline_29-5-13.pdf The only estimate of the costs of ecosystem damages resulting from eutrophication is 1.5 – 3.8 billion US$/year for the USA (Dodds et al. 2009 see SCOPE Newsletter 72). Catchment modelling. Despite considerable efforts worldwide, catchment models for the prediction of phosphorus losses suffer from high uncertainties: it is complex and difficult predicting phosphorus losses at the catchment and basin scale. In all cases, considerable local adaptation to account for local context and farming practices is necessary. This is partly because a large proportion of phosphorus losses often come from ‘particularities’ such as storm flows, localised soil erosion, specific problems with animal or manure management or small areas with high losses. Long term field trials. Phosphorus in soil and phosphorus crop productivity need to be considered over long time periods (ten years or more), to take into account soil P accumulation and changes in phosphorus forms in soil. Long term field trials are thus essential, and this message should continue to be emphasised to R&D funding bodies. Agricultural ‘BEMP’ (Best Environmental Management Practice) fact sheets. Such tools exist, to inform farmers and agricultural advisors to reduce nutrient losses, produced by a number of organisations (SERA17, EU COST, Baltic, Canada …) but would strongly benefit from updates to take into account new knowledge concerning, e.g. long-term performance of buffer strips or impacts on phosphorus run-off of “no till”. Optimisation could be achieved by bringing together the different sets of fact sheets existing worldwide to produce updated sets for each region. This project discussed in 2015 has not progressed (see SCOPE Newsletter 115). Through the P-RCN activities, the participants have published a number of joint papers addressing general questions of phosphorus sustainability, listed below. The P-RCN participants have published during the project’s duration a larger number of papers which benefited from input and enrichment from the P-RCN collaboration process.